Rain, real name Jung Ji-Hoon, 24th year old. South Korean pop sensation kicked off the Asia leg of his world tour in Hong Kong with legions of screaming female fans, fireball pyrotechnics and trademark trendy dancing. “How are you,” the pan-Asian heart-throb asked in Hong Kong’s native Cantonese dialect shortly after going on stage, arousing an even more deafening din from the audience. His next station will be in Singapore, 21th Jan 2007. This entry was posted on Monday, January 15th, 2007 at 2:05 pm	and is filed under Funny Junk. You can leave a response, or trackback from your own site. 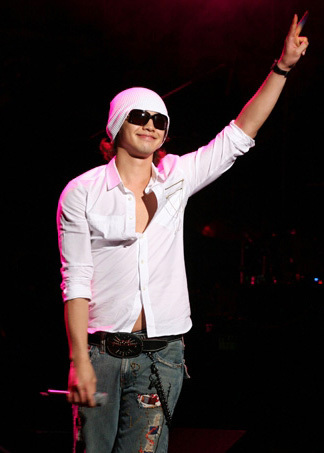 2 Responses to "Rain – South Korean Pop Sensation World Tour in Hong Kong"
hey i really luv the way u smile, luv the way u sing, luv the way u dance……..i luv everything u do, keep it up….take care.